The Merry Harriers is to rise again from the ashes. 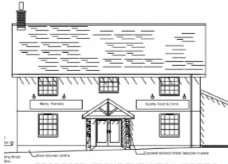 Planning permission has been given for a new pub on the site of the historic building wrecked by fire last year. The front of the pub is to be rendered all over instead of the original plan for red brick on the lower half of the building. The planners have also imposed road safety conditions covering drivers' visibility and the surface of the car park and have insisted on the builders providing habitats for bats and swallows. You can see all the planning documents for the new Merry Harriers on this link. Reg Payne, owner of the Merry Harriers, Clayhidon, has stirred controversy with his plans for building a new pub on the same site following two arson attacks last year. But ther plans have been condemned by local people for being out of keeping with the character of the Blackdowns. While most objectors welcome the principle of replacing the building, there is widespread disappointment with the design, which objectors say looks more like a suburban house than an iconic country inn. You can see the detailed plans and also all the public comments on this link. There is also annoyance that because the site is a few feet inside Somerset, the nearest neighbours, who live on the Devon side of the county border, were not consulted. Yet many of the old pub’s customers, and many of the people using this road dangerous junction, live in Clayhidon. Other objectors included Kate and David Hewitt, of Clayhidon, who made a plea for incorporating the iconic wooden beams of the old building and for retaining the skittle alley, which is facing demolition. Both the Hewitts and Mr and Mrs Purvis of the Kingsmead Centre, called for an improvement to the “whiffy” sewerage system and to the dangerous blind road junction. They said other people would have expressed similar views if they had been informed of the application.